Health, Wellness, Sports and Things. 250 kilometers separate my home of Drogheda and Thomond Park. 250 kilometers that have been travelled many times of late. Past the ever flying blue flags of Leinster in Julianstown. Under the landing jets on the M1. The gritty M50, the brake testing N7 and finally the M7, the road to Limerick City and Thomond Park. Two and a half hours of driving, usually in the giddy company of fellow Munster supporter, my girlfriend Clíona and a shopping bag full of – soon to be regretted – goodies. It has only really been the last two years that I have started to back-up my support for Munster with the monthly or fortnightly trips down south. Hence, it is unsurprising that in the last two years my support has inched closer to a mild obsession. Rewatching miracle matches, singing Stand Up and Fight, buying new jerseys, reading biographies and endless news articles. I am the only person I know that hasn’t gotten sick of my ramblings about Munster at some stage. Munster rugby, is without doubt my favorite thing to talk about on a daily basis. I grew up in a GAA house with soccer coming in at number 2. Rugby was not really a thing. My Dad and older brother, like me, are a lovers of all things sport, but rugby really was down the pecking order in our family. It took the genius of Brian O’Driscoll in Paris back in March of 2000 to propel rugby onto my radar. From then on, oval balls were thrown onto Santa lists and imaginary Champions League nights were traded in for 6 Nations battles out on the street. Myself as O’Driscoll and Ronan, my next door neighbour, as O’Gara combined to win GrandSlams to beat the band. But unfortunately, playing rugby never penetrated my busy schedule of Gaelic football, soccer, athletics and dodging homework. Despite this, my support for Irish rugby grew. Shane Horgan became the local hero in my eyes – replacing Gary Kelly and… Johnny Logan. And then, through the 2000’s I began to notice Munster Rugby. A strange sporting euphoria coming from down south of the country. The Heineken Cup Final in 02, The Miracle Match a year later, more semi-finals before finally, the late Anthony Foley got his and Munster’s hands on the Heineken Cup for the first time in 2006 after beating Biarritz in Cardiff. Alongside Foley were names like O’Connell, O’Gara, Stringer, Wallace, Leamy, Hayes, Flannery. Guys who I had been screaming at the telly for while they wore the green of Ireland. In red, nothing changed. These were the guys I looked up to most as rugby players. In 2008, they went and did it again, same venue only this time beating European heavyweights Toulouse. And by 2009, that fateful moment, “this must be it for Ronan O’Gara, drop at goal, Grand Slam at stake…” I wasn’t just proud to be Irish, but I was proud to be a Munster supporter. But being that stereotypical patriotic sporting fan, I have also cheered on Leinster through some of their glory moments. I particularly recall screaming at the TV with delight when Johnny Sexton masterminded that comeback against Northampton in 2011. But with this, and all other Leinster Rugby moments, they just didn’t draw me in like Munster did. Munster are just different. One big thing for me is that I never played Rugby so I didn’t have any rugby based social capital. I think that this can be a big turnoff for all non-rugby playing people around these parts. I would find myself being ecstatic about an Ireland win, but afraid to talk about it outside of my friends and family. I didn’t know the difference between blindside and openside, I hadn’t a breeze what the anatomy of a scrum was and 90% of the time I couldn’t even guess why the referee was awarding a penalty. In Leinster, I felt – rightly or wrongly – that if you didn’t play rugby, you didn’t really belong in those circles. In contrast, I was in Limerick last week for the Champions Cup game against Gloucester. Afterwards, I stopped in Arthur’s Quay Shopping Centre for a pee. Being in a world of my own, I was late to realise two men abruptly entering the toilet right behind me. Now I’m not one to judge anybody by the way that they look, but lets just say, I felt a bit safer going into the cubicle and closing the door swiftly behind me. The two guys were edgy, wearing dark baggy clothes and speaking over each other with their proper ‘Limerick City Boiii’ diction. I propped my ever adapting ear up towards the gap above the door. It took me a few seconds, but then I decoded it, and to my astonishment they said, “That would not happen last year. I’m telling you. Last year would have been different. Erasmus wouldn’t allow them to stop playing like that.” Two – what I would call – characters, who moments ago I was a little bit scared of, are arguing over just discussing today’s game. I instantly thought of Sinead Kissane’s article in the Independant on how there’s no such thing as a class divide when it comes to Sport in Limerick. She is right, If you’re a Munster supporter, you belong. In my work as a teacher, I deliver a workshop on ‘The Self-Determination of Motivation’. According to this theory, one of the needs for self motivation is “relatedness”. It means being a part of something that’s bigger than yourself. When delivering this workshop, I always explain this through Munster Rugby and the tragic yet heartwarming story of Anthony Foley. I explain to the students that Munster Rugby is not about one guy. It isn’t the 15 players on the field, the backroom staff or the supporters in Thomond Park. Munster Rugby is not even the province of Munster. Munster Rugby is somehow bigger than all of those things. It is a collective of them all and still more. 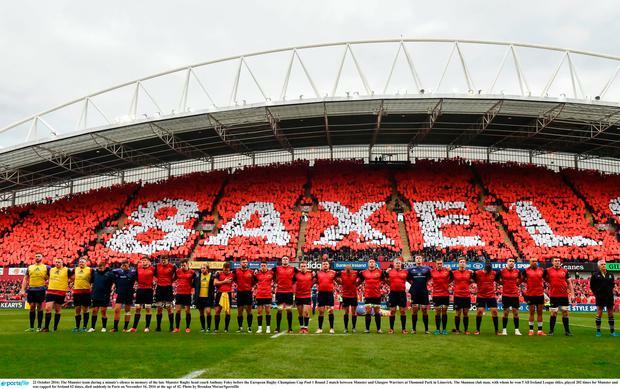 By being a Munster supporter, you are welcome into the Munster community. Whether you’re lucky enough to pull on the jersey or you just cheer on “Cooga Moon” from your sofa on a Friday night, you are a part of the same big Munster Rugby family. This is why I support Munster.